The over 100 participants came from academia, archaeological open-air museums, skills backgrounds or otherwise. In the two-day conference they witnessed papers including themes like the Mary Rose kitchen, Stone Age halberds, medieval dental treatment, how warm is an Anglo Saxon house and spinning experimentation, to mention just a few. The papers and posters were very accessible and rarely overtly technical. Workshops included flint knapping, chiselling on stone, playing musical instruments, hand spinning and antler working. Special mention is for the bronze casting group which came all the way from Italy. St Fagans also had demonstrations running on milling, clog making, weaving and forging iron. 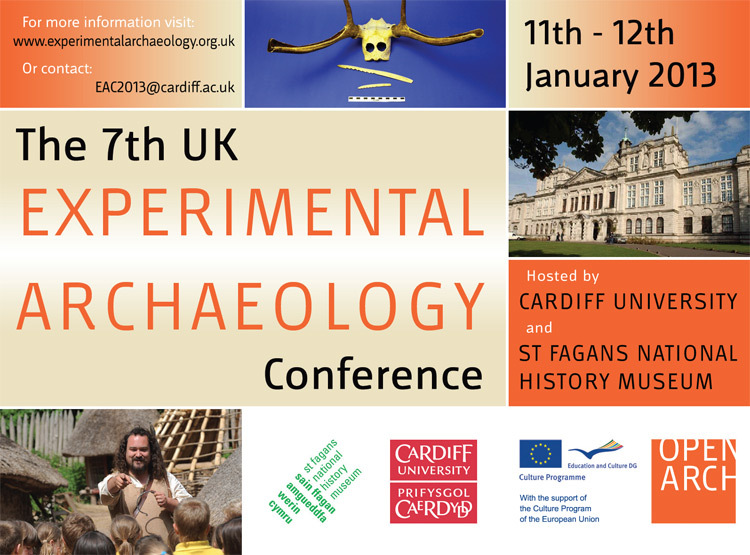 The archives of all previous seven UK experimental archaeology conferences as well as information about future editions can be found at the website mentioned below. EXARC took an active role in promoting, the EXARC Board meeting took place in the shadow of this conference.